Located in Mansfield, OH, we are your local, comprehensive dental solution for the entire family. Cricket Lane Dental can help you begin your journey to a healthy, beautiful smile. Dental health moves through many stages. Dr. Roark and Dr. Figley in Mansfield, OH offer a range of preventive, cosmetic, & functional care for every age. Dr. Roark and Dr. Figley offer cosmetic dentistry options that perfect your smile & restore your confidence. Dental emergencies can happen anytime, anywhere. The team at Cricket Lane Dental is ready to help when a dental emergency strikes. With our convenient location in Mansfield, OH, we treat patients from the nearby areas of Richland, Ashland, and Morrow Counties. Cricket Lane Dental manages everything from your family’s cleanings and exams to mini implants, cosmetic dentistry, root canals, tooth-colored fillings, periodontal therapy, and Invisalign. Dr. Randell Roark and Dr. Drew Figley are committed to delivering exceptional dental care in a compassionate and warm atmosphere. We treat our patients like family and love the lifelong relationship that develops from caring for each patient’s unique needs. Dr. Randell Roark did his undergraduate studies at John Carroll University where he received a Bachelor of Science degree. Dr. “Randy” graduated from The Ohio State University College of Dentistry in 2003. 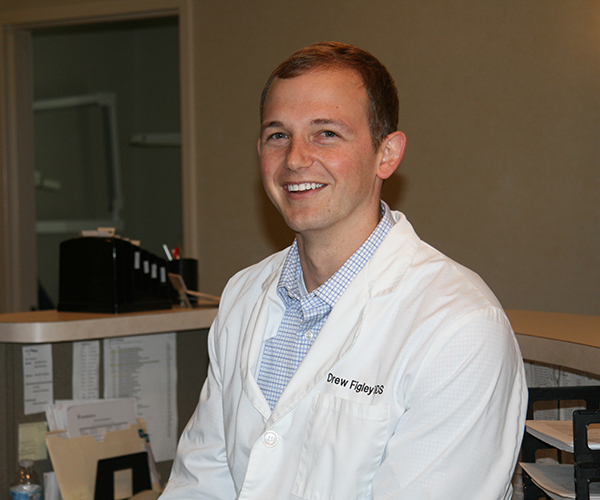 Dr. Drew Figley was raised locally and graduated from Crestview High School. He then studied biology and chemistry at Heidelberg University. After earning his Bachelor of Science degree, Drew attended dental school at The Ohio State University, graduating in 2015. "Very friendly, welcoming atmphosmere. I recommended this Dental office to anyone that needs dental work done. I had a procedure done that took 3 hours. They keep me very comfortable and informed me along the way." "Everyone here is very professional and very nice. They were able to squeeze me in at the last minute. Dr. Roark truly cares about his patients. I highly recommend him. There was no pain what so ever with my procedure." "The staff has always been kind and patient. Dr Roark is great. No pain for me or my kids during fillings. Also a nice family atmosphere. I recommend this practice to everyone." "Our family has been going to this office for many years. The doctors and dental hygienist here are great! They are very professional and very knowledgeable. I would definitely highly recommend them!!!" Schedule an appointment with Cricket Lane Dental today!